Motoko Nakatani is an avid quiller in Japan who loves teaching others. She and I first met at a convention of the North American Quilling Guild several years ago. Maggie, as she prefers to be called, was introduced to paper filigree while she owned a small toy and goody shop in Kobe. She liked the look of rolled paper so much, she taught herself and began importing quilling tools and paper from the United States and England to sell. After attending her first NAQG convention, Maggie was inspired to offer quilling classes in which she taught the techniques and ideas she'd gained from other NAQG members. Now she teaches beginner, intermediate, and accomplished classes ten days each month, and reports that interest in quilling in Japan continues to increase. Maggie is also the lead instructor for Botanical Quilling Japan, a group that expresses the seasonal beauty of plants and flowers. You can see more of Maggie's lovely quilling in her gallery. When I noticed Maggie rolling coils with a Japanese tool, I couldn't believe the incredibly tiny crimp it made. Luckily she had brought extras along in her suitcase and I purchased one on the spot. The ultra-fine slot is set well down into the tool's handle, the ribbed area at the top provides a nice place for fingers to rest, and the white disc rotates smoothly on the palm as the tool is turned. It's a precision instrument, not an ordinary sewing needle with the eye's tip snapped off, which is what seems to define current U.S. fine-slotted tools. This is a close up of some quilling I did with the tool, using graduated color strips. Notice how teeny-tiny the marquise and tight coil centers are! If you'd like to buy the tool, contact Maggie via email (unless you're in Japan and prefer to order directly from her online store.) PayPal isn't popular there, but Maggie accepts VISA or Mastercard. At $25 plus EMS trackable shipping, it's not inexpensive, but I can vouch for the fact that the tool is superior to any I've used. EDIT: As of May 2012, Maggie is now able to accept PayPal transactions. Contact her at info@e-bison.co.jp. By the way, I'd like to make it clear that Maggie did not ask me to blog about her or the tool. This post is strictly my idea and I receive no commission from sales. One more thing... A regular slotted tool still comes in very handy when making folded roses and rolling fringed strips. Make that two things... If you haven't left a comment yet to enter my First Blogiversary Giveaway, it's not too late - the contest ends at midnight tonight EST. Good luck! 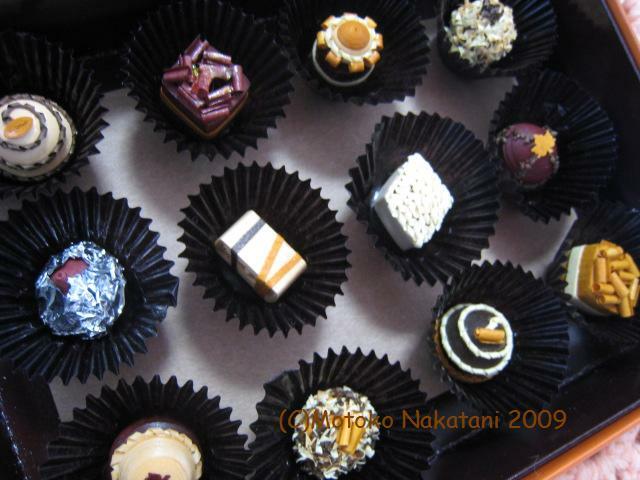 Oh those chocolates look delicious! Yum! You always have me leaving your blog wanting more! What an awesome find. "What crimp?" I said. Exquisite holes. Thanks for giving your opinion on the tool - I can't wait to try it out! Thanks, Ann, for letting us know about the fine quilling artists all over the world. the floral arrangements are beautiful!! i didn't believe they were quilled and thought they were real until i enlarged the picture!!! Her work is amazing. 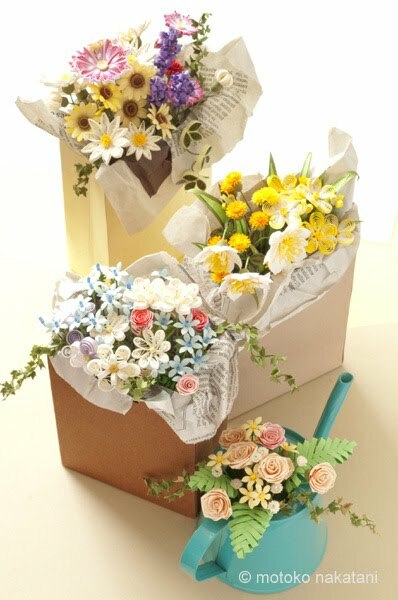 I can't believe those floral arrangements, they are beautiful. The quilling you did using her tool is also great. The flowers are great. Sweet. Congratulations. And you, my friend, are single handedly responsible for spreading the word about so many high caliber paper artists, quillers in particular. Thank you for that. I was telling my friend Jen about your blog the other day when I heard myself say "It's my favorite blog," - and I realized that's true. Quilling is getting popular little by little here in Japan. I am very glad to see your comment! I don't know how you found my blog but I am so glad you did! I love your blog! I just started quilling and I am loving adding it to my scrapbook pages!! I am following your blog so that I can learn from your tutorials! Love it! TFS! thanks ann for showcasing maggie's wonderful quilling and nifty quilling tool. Such lovely comments everyone; thanks so much for taking the time to write them.